Name Variation Johann Friedrich Conrad Grages was also known as August Friedrich. Name Variation Johann Friedrich Conrad Grages was also known as Fred. Name Variation Johann Friedrich Conrad Grages was also known as Frederick. Johann Friedrich Conrad Grages was born on 21 January 1794 at Bokeloh, Wunstorf, Hannover, Germany. He was the son of Carl Heinrich Grages and Maria Ilse Dorothea Freyse. Johann Friedrich Conrad Grages married Catherina Dorothea Stock on 23 June 1831 at Idensen, Wunstorf, Kr. Schaumburg, Germany. Johann Friedrich Conrad Grages died on 21 August 1867 at Crete, Will, Illinois, at age 73. He was buried after 21 August 1867 at Zion United Church of Christ Cemetery (aka Zion UCC Cemetery), Dyer, Lake, Indiana. Name Variation Catherina Dorothea Stock was also known as Katharina. Name Variation Catherina Dorothea Stock was also known as Dorothy. Name Variation Catherina Dorothea Stock was also known as Dorothea. Married Name 23 June 1831 As of 23 June 1831,her married name was Grages. Catherina Dorothea Stock was born on 11 February 1804 at No. 17 Idensen, Wunstorf, Kr Schaumburg, Germany. She married Johann Friedrich Conrad Grages, son of Carl Heinrich Grages and Maria Ilse Dorothea Freyse, on 23 June 1831 at Idensen, Wunstorf, Kr. Schaumburg, Germany. Catherina Dorothea Stock died on 3 April 1875 at Crete, Will, Illinois, at age 71. 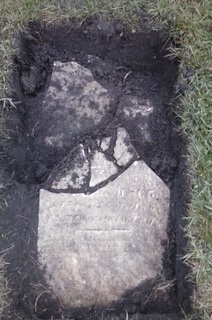 She was buried after 3 April 1875 at Zion United Church of Christ Cemetery (aka Zion UCC Cemetery), Dyer, Lake, Indiana. [S247] U.S. Federal Census 1870 U.S. Federal Census, by Ancestry.com, Stamp 32. Page 31. Dwelling 201. Carl Heinrich Grages was born on 5 January 1758 at Idesen, Wunstorf, Germany, also reported as Bokeloh, Wunstorf, Germany. He was the son of Jurgen Johann Grages and Margarete Bahren. Carl Heinrich Grages married Dorothea Sophie Meyers on 23 February 1786 at Bokeloh, Wunstorf, Germany. Carl Heinrich Grages married Maria Ilse Dorothea Freyse in February 1791. Carl Heinrich Grages married Engel Marie Bolten on 3 March 1800. Carl Heinrich Grages married Anne Sophie Margaret Guemmer before 1810. Name Variation Maria Ilse Dorothea Freyse was also known as Maria Dorothea. Married Name February 1791 As of February 1791,her married name was Grages. Maria Ilse Dorothea Freyse was born circa 1758. She married Carl Heinrich Grages, son of Jurgen Johann Grages and Margarete Bahren, in February 1791. Maria Ilse Dorothea Freyse died on 9 December 1799 also reported as 12 Sep 1799. Jurgen Johann Grages married Margarete Bahren. Jurgen Johann Grages was born on 31 August 1727 at Bokeloh #5, Wunstorf, Neustadt, Hannover, Germany. He was the son of Johann Grages and Anna Catharina Siemers. Jurgen Johann Grages died on 18 March 1804 at Bokeloh 5, Neustadt, Hannover, Germany, at age 76. Married Name Her married name was Grages. Margarete Bahren married Jurgen Johann Grages, son of Johann Grages and Anna Catharina Siemers. Margarete Bahren was born on 2 April 1727 at Bokeloh 5, Neustadt, Hannover, Germany. She died on 10 February 1799 at Bokeloh 5, Neustadt, Hannover, Germany, at age 71. Name Variation Heinrich Gustav Friedrich Klemme was also known as Fred. Heinrich Gustav Friedrich Klemme was born on 17 May 1878 at Illinois. He was the son of Heinrich Christian Klemme Jr. and Maria Dorothea Sophia Grages. Heinrich Gustav Friedrich Klemme married Anna K. D. Hinrichs, daughter of Prismer Hinrichs and unknown (? ), circa 1906. Heinrich Gustav Friedrich Klemme died on 1 March 1966 at South Chicago Heights, Illinois, at age 87 Fred Klemme obituary. He was buried after 1 March 1966 at Adams Cemetery, Crete, Will, Illinois. [S193] Church Record, Zion United Lake Co IN Extract, Confirmation pg 261. [S193] Church Record, Zion United Lake Co IN Extract, Baptism pg 456. No 57. [S243] U.S. Federal Census 1920 U.S. Federal Census, by Ancestry.com, ED145. Dwelling 219. [S250] U.S. Federal Census 1930 U.S. Federal Census, by Ancestry.com, ED99-4. Dwelling 98. Heinrich Christoph Klemme died on 2 February 1826. Friedrich Christian Klemme was born on 16 December 1826 at Sabbenhausen, Lippe Detmold, Germany. Friedrich Christian Klemme died on 11 February 1829 at age 2. Name Variation Heinrich August Christoph Klemme was also known as Henry. He married Katharina Grages, daughter of Johann Friedrich Conrad Grages and Catherina Dorothea Stock, circa 1855. Heinrich August Christoph Klemme died on 18 May 1901 at Crete, Will, Illinois, at age 73. He was buried on 21 May 1901 at Zion United Church of Christ Cemetery, Dyer, Lake, Indiana, also reported as Bemer Ev. Cemetery in Hanover, IN. 1862 Able Bodied Male Citizens, Crete, Will, Illinois Heinrich August Christoph Klemme appeared on the census of 1862 at Able Bodied Male Citizens, Crete, Will, Illinois, Number 105. Klemme, Henry, age: 36, Town: Crete, Nativity: Germany, Occupation: brick maker. 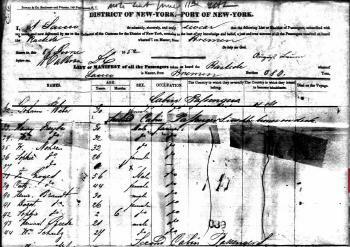 Heinrich August Christoph Klemme immigrated with Heinrich Christian Klemme and Anna Marie Elizabeth Brenker on 11 July 1848 at New York; Heinrich Klemme came to America in 1848 with seven children. (Also reported as "The ship was Brig Reform. It left from Bremen, Germany on 5-9-1848 and arrived in New York on 6-28-1848. #330 Christian Klemme of Sabbenhausen house # 39 occupation farmer, with wife and seven children. Page S-135."). 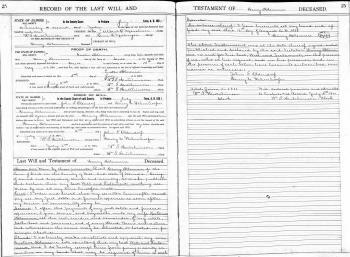 Heinrich August Christoph Klemme left a will on 16 August 1898 at Will, Illinois. Before 1901 portrait of Henry and Katherine (Grages) Klemme family. 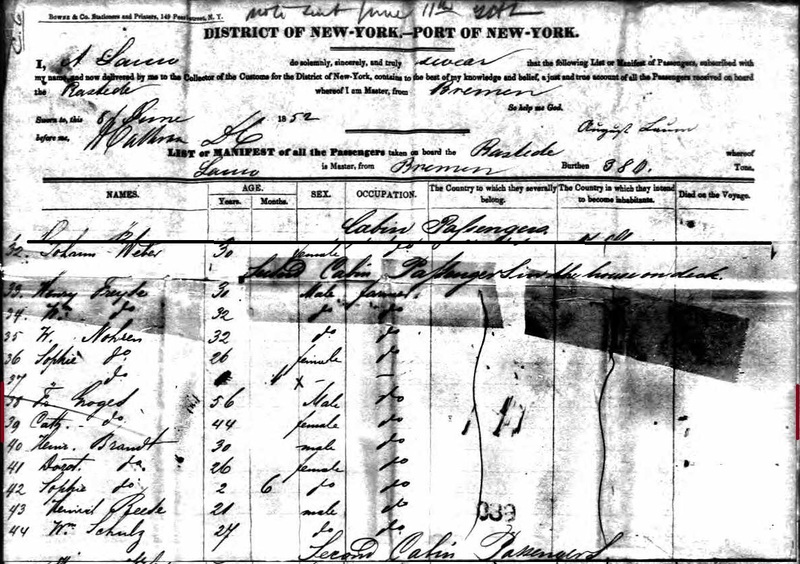 [S246] U.S. Federal Census 1880 U.S. Federal Census, by Ancestry.com, ED190. Pg 28. Dwelling 261. [S245] U.S. Federal Census 1900 U.S. Federal Census, by Ancestry.com, Dwelling 218. ED 101. Name Variation Katharina Grages was also known as Catharine. Name Variation Katharina Grages was also known as Catherine. Married Name circa 1855 As of circa 1855,her married name was Klemme. Katharina Grages was born on 6 January 1838 at Eiden, Germany. 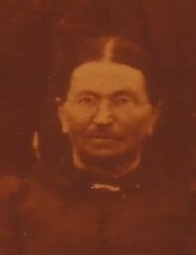 Katharina Grages married Heinrich August Christoph Klemme, son of Heinrich Christian Klemme and Anna Marie Elizabeth Brenker, circa 1855. Katharina Grages died on 13 December 1904 at Dyer, Lake, Indiana, at age 66. She was buried after 13 December 1904 at Bemer Ev. Cemetery, Hanover, Lake, Indiana. Ship Name: Bastide. 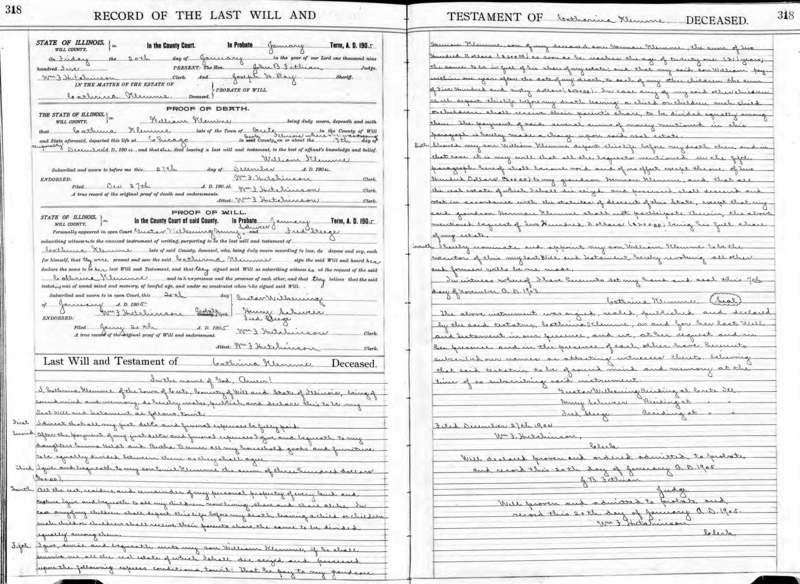 In Heinrich August Christoph Klemme's will dated 16 August 1898 at Will, Illinois, Katharina Grages was named as an heir. She had 13 with 11 living in 1900 children. Before 1901 portrait of Henry and Katherine (Grages) Klemme family. 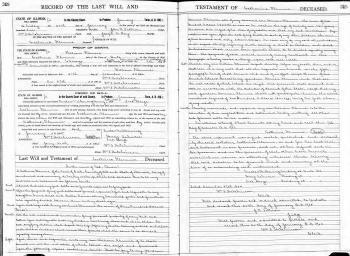 She left a will on 7 November 1903 at Will, Illinois. Name Variation Wilhelmine Friederike Dorothea Caroline Klemme was also known as Catherine. Name Variation Wilhelmine Friederike Dorothea Caroline Klemme was also known as Karoline. Name Variation Wilhelmine Friederike Dorothea Caroline Klemme was also known as Caroline. Name Variation Wilhelmine Friederike Dorothea Caroline Klemme was also known as Carol. 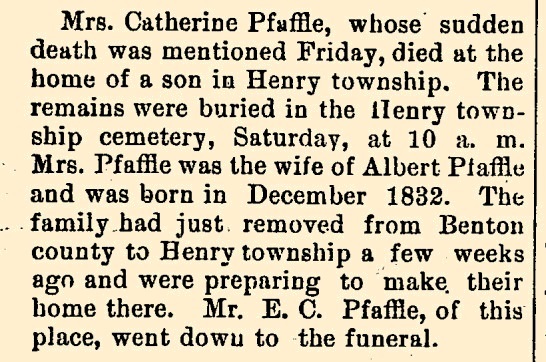 Married Name 1854 As of 1854,her married name was Pfaffle. Wilhelmine Friederike Dorothea Caroline Klemme was born on 6 December 1832 at Sabbenhausen, Lippe Detmold, Germany. She was the daughter of Heinrich Christian Klemme and Anna Marie Elizabeth Brenker. 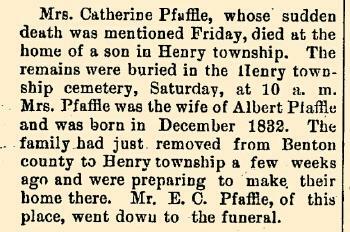 She married Albert William Pfaffle in 1854 at Will, Illinois. Wilhelmine Friederike Dorothea Caroline Klemme died on 14 May 1891 at Henry, Plymouth, Iowa, at age 58 Catherine (Klemme) Pfaffle obituary. She was buried after 14 May 1891 at Pleasant Hill Cemetery, Akron, Plymouth, Iowa. Wilhelmine Friederike Dorothea Caroline Klemme immigrated with Heinrich Christian Klemme and Anna Marie Elizabeth Brenker on 11 July 1848 at New York; Heinrich Klemme came to America in 1848 with seven children. 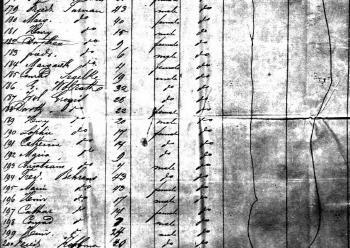 [S248] U.S. Federal Census 1860 U.S. Federal Census, by Ancestry.com, Year: 1860; Census Place: Washington, Will, Illinois; Roll: M653_238; Page: 471; Family History Library Film: 803238. Wilhelmine Luise Elisabeth Klemme was born on 27 April 1837 at Sabbenhausen, Germany. Wilhelmine Luise Elisabeth Klemme was christened on 4 May 1837 at Evangelisch, Falkenhagen, Lippe, Germany. She died on 21 April 1839 at Germany at age 1. Name Variation Heinrich Fredrick Wilhelm Klemme was also known as Wilhelm. Name Variation Heinrich Fredrick Wilhelm Klemme was also known as Heinrich Friedrich Wilhelm. Name Variation Heinrich Fredrick Wilhelm Klemme was also known as William. Name Variation Heinrich Fredrick Wilhelm Klemme was also known as Wahrscheinlich Friedrich. Heinrich Fredrick Wilhelm Klemme was born on 24 February 1839 at Sabbenhausen, Lippe Detmold, Germany. Heinrich Fredrick Wilhelm Klemme was christened on 10 March 1839 at Evangelisch, Falkenhagen, Lippe, Germany. Heinrich Fredrick Wilhelm Klemme immigrated with Heinrich Christian Klemme and Anna Marie Elizabeth Brenker on 11 July 1848 at New York; Heinrich Klemme came to America in 1848 with seven children. [S193] Church Record, Zion United Lake Co IN Extract, Pg 49. [S248] U.S. Federal Census 1860 U.S. Federal Census, by Ancestry.com, Dwelling 1768. Wilhelmine Elisabeth Klemme was born on 27 December 1840 at Sabbenhausen, Germany. Wilhelmine Elisabeth Klemme was christened on 16 January 1841 at Evangelisch, Falkenhagen, Lippe, Germany. She died on 20 February 1842 at Germany at age 1. 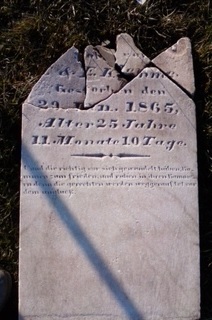 Baby boy Klemme died on 27 January 1843 at Sabbenhausen, Germany. He was born on 27 January 1843 at Sabbenhausen, Germany. Name Variation Christian Karl Hermann Klemme was also known as Carl. Name Variation Christian Karl Hermann Klemme was also known as Charles. Christian Karl Hermann Klemme was born on 8 March 1846 at Sabbenhausen, Germany. [S193] Church Record, Zion United Lake Co IN Extract, Baptism pg 156. No 18. [S193] Church Record, Zion United Lake Co IN Extract, Pg 155. [S193] Church Record, Zion United Lake Co IN Extract, Baptism pg 514. No 70. Name Variation John Charles Klemme was also known as John M.
Name Variation John Charles Klemme was also known as Johann. John Charles Klemme was born on 17 May 1864 at Endor, Crete Twp, Will, Illinois. He was the son of Heinrich August Christoph Klemme and Katharina Grages. 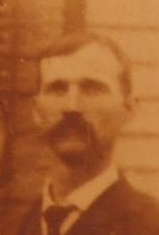 John Charles Klemme married Ella Sarah Corwin, daughter of Eleazer Miles Corwin and Almeda Kelley, on 15 August 1885 at Crete, Will, Illinois. 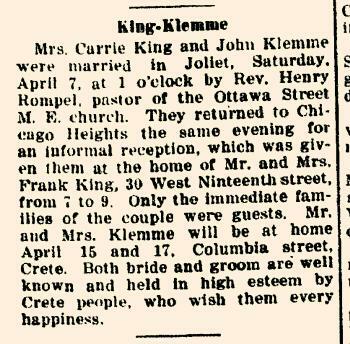 John Charles Klemme married Carrie K. Merrill on 7 April 1923 at Joliet, Will, Illinois, Mrs Carrie (Merrill) King and John Charles Klemme marriage announcement. John Charles Klemme died on 25 April 1952 at Crete, Will, Illinois, at age 87 Final rites were held Sunday at the First Methodist church, Crete, for John Klemme, 87, of 1227 Columbia street, Crete, who died Friday at St. James hospital, Chicago Heights. The Rev. Thoburn Anderson officiated at the rites, and burial was at Adams cemetery. 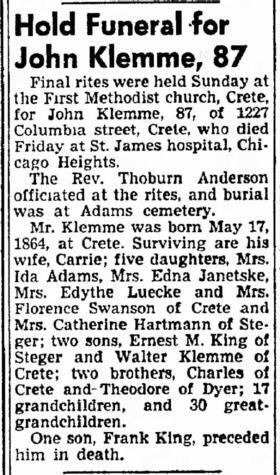 Mr. Klemme was born May 17, 1864, at Crete. Surviving are his wife, Carrie; five daughters, Mrs. Ida Adams, Mrs. Edna Janetske, Mrs. Edythe Luecke and Mrs. Florence Swanson of Crete and Mrs. Catherine Hartmann of Steger; two sons, Ernest M. King of STEGER and Walter Klemme of Crete; two brothers, Charles of Crete and Theodore of Dyer; 17 grandchildren, and 30 great grandchildren. One son, Frank King, preceded him in death. He was buried after 25 April 1952 at Adams Cemetery, Crete, Will, Illinois. 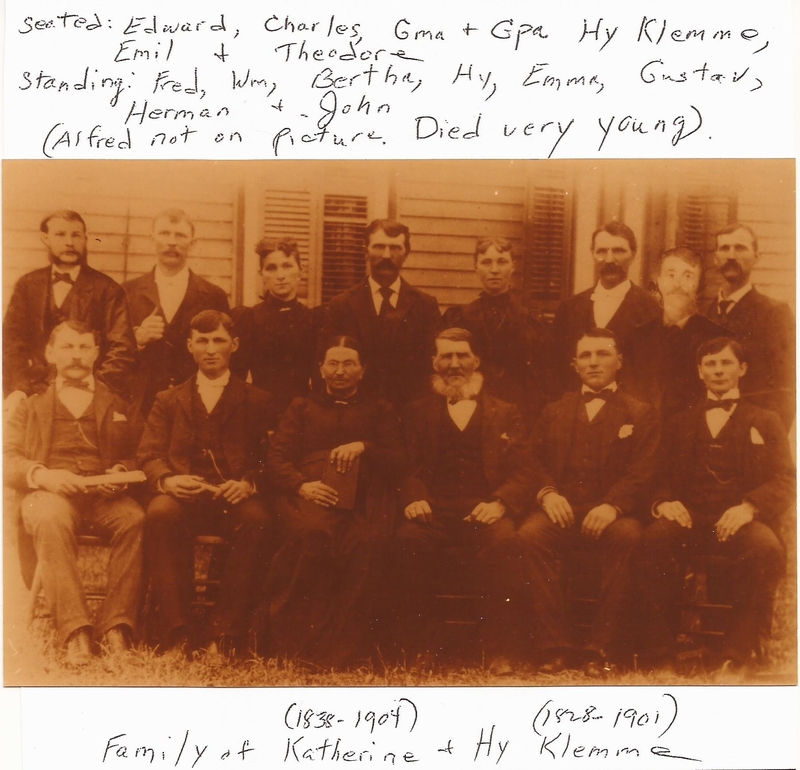 The Klemme family originated in Germany. Today there is still a road named Klemme in Crete which runs for a mile and half or so parallel to the Illinois/Indiana state border. John Klemme, Ida's father, was an auctioneer, the only one licensed to operate from Joliet, Illinois to Crown Point, Indiana. Ida was a member of a large family: she had eleven brothers and one sister. From http://www.pibburns.com/carbtill.htm. John Charles Klemme was confirmed in 1879 at Zion United Church of Christ, Hanover, Lake, Indiana.8 Before 1901 portrait of Henry and Katherine (Grages) Klemme family. [S193] Church Record, Zion United Lake Co IN Extract, No 91. Page 624. [S245] U.S. Federal Census 1900 U.S. Federal Census, by Ancestry.com, Dwelling 209. ED 101. [S244] U.S. Federal Census 1910 U.S. Federal Census, by Ancestry.com, Sheet 18B. ED144. Dwelling 91. [S243] U.S. Federal Census 1920 U.S. Federal Census, by Ancestry.com, Dwelling 94. ED146. Sheet 4B. [S250] U.S. Federal Census 1930 U.S. Federal Census, by Ancestry.com, ED99-2. Dwelling 161. [S193] Church Record, Zion United Lake Co IN Extract, Confirmation Pg 257. Name Variation Ella Sarah Corwin was also known as Sarah Ella. Name Variation Ella Sarah Corwin was also known as Ellen. Married Name 15 August 1885 As of 15 August 1885,her married name was Klemme. Ella Sarah Corwin was born on 14 February 1869 at Danville, Vermilion, Illinois. She was the daughter of Eleazer Miles Corwin and Almeda Kelley. Ella Sarah Corwin married John Charles Klemme, son of Heinrich August Christoph Klemme and Katharina Grages, on 15 August 1885 at Crete, Will, Illinois. She was buried after 2 August 1921 at Adams Cemetery, Crete, Will, Illinois. Family story says she met John Klemme when she came to stay with the Klemme family as a traveling seamstress. She would stay with a family, outfit them with new clothes and then go on to another family. She had a regular circuit of families that employed her to sew for them. 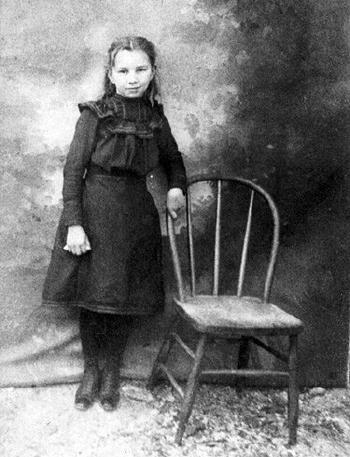 Ella Sarah Corwin had 4 with 3 living in 1900 children. She had 5 with 4 living in 1910 children. [S238] Illinois Death Records, by Illinois, certificate 0024347. 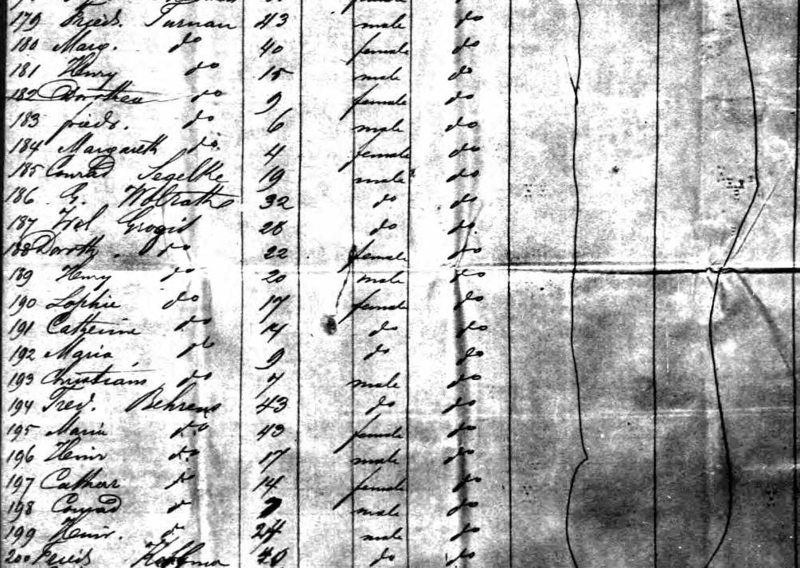 [S247] U.S. Federal Census 1870 U.S. Federal Census, by Ancestry.com, Microfilm # 593-285. Number 171 Dwelling 167. He was born on 11 May 1890 at Dyer, Hanover Twp, Lake, Indiana. He was the son of John Charles Klemme and Ella Sarah Corwin. [S193] Church Record, Zion United Lake Co IN Extract, Deaths pg 226. Married Name 12 October 1911 As of 12 October 1911,her married name was Adams. Ida Linda Klemme was born on 26 April 1891 at Crete, Will, Illinois. She was the daughter of John Charles Klemme and Ella Sarah Corwin. Ida Linda Klemme witnessed the marriage of August Joseph Janetske and Edna Leona Klemme on 28 April 1923 at St. Liborius Church, Steger, Will, Illinois; Receiption for Mr and Mrs Gus Janitzki held 06 May 1923. Ida Linda Klemme witnessed the burial of Margaret Erickson in May 1948 at Illinois; Mr and Mrs Walter Klemme and daughter Joan, Mrs Leslie Adams, Mrs Dee M Sumpter, Mrs Gus Janetske and Mrs A C Hartmann attended funeral services for Margaret Erickson at the West End funeral chapel, Chicago Heights, last Wednesday afternoon. Miss Erickson, who died suddenly May 9 at her home in Chicago was a sister of Mrs Klemme and was a former resident of Chicago Heights. Ida Linda Klemme witnessed the burial of Heinrich Wilhelm Klemme in January 1953 at Saint Luke Cemetery, Beecher, Will, Illinois. Ida Linda Klemme witnessed the burial of Henry E. Klemme in January 1953 at Zion Evangelical and Reformed Church, Hanover Prairie, Dyer, Indiana; Henry Klemme funeral notice. Ida Linda Klemme died on 11 August 1982 at Richton Park, Cook, Illinois, at age 91. She was buried on 14 August 1982 at Adams Cemetery, Crete, Will, Illinois. Ida Linda Klemme obtained US Social Security Card at Illinois; Last residence Crete, Will, Illinois. On 12 October 1961 at Crete, Will, Illinois, Leslie and Ida (Klemme) Adams 50th wedding anniversary celebration. 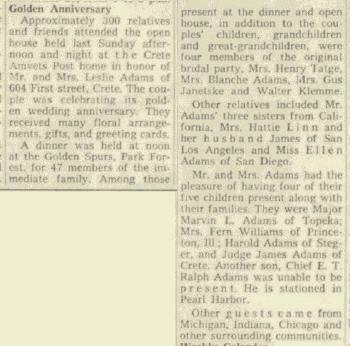 On 28 April 1963 at Crete, Will, Illinois, attended Gus and Edna (Klemme) Janetske 40th wedding anniversary surprise party. [S193] Church Record, Zion United Lake Co IN Extract, Pg 624. No 91. [S243] U.S. Federal Census 1920 U.S. Federal Census, by Ancestry.com, ED146. Dwelling 49. [S250] U.S. Federal Census 1930 U.S. Federal Census, by Ancestry.com, ED99-2. Dwelling 166. 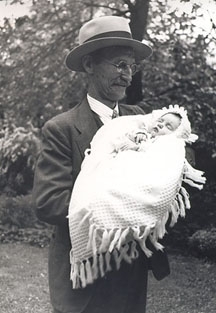 Leslie Byron Adams was born on 27 February 1889 at Crete, Will, Illinois. He was the son of Byron Edwin Adams and Carrie Bell Tillotson. Leslie Byron Adams witnessed the marriage of August Joseph Janetske and Edna Leona Klemme on 28 April 1923 at St. Liborius Church, Steger, Will, Illinois; Receiption for Mr and Mrs Gus Janitzki held 06 May 1923. Leslie Byron Adams died on 25 May 1976 at Chicago Heights, Cook, Illinois, at age 87. He was buried after 25 May 1976 at Adams Cemetery, Crete, Will, Illinois. Leslie Byron Adams obtained US Social Security Card at Illinois; Last residence Crete, Will, Illinois. Leslie Adams was named Citizen of the Year in 1972 by the Crete Amvets. He died May 25, 1976 and is buried in Crete, Will County, Illinois. Ida was marshall of Crete's Memorial Day Parade in 1980. She died August 11, 1982 and is also buried in Crete. On 12 October 1961 at Crete, Will, Illinois, Leslie and Ida (Klemme) Adams 50th wedding anniversary celebration. Married Name 3 October 1886 As of 3 October 1886,her married name was King. Married Name 7 April 1923 As of 7 April 1923,her married name was Klemme. Carrie K. Merrill was born on 3 November 1869 at Merrillville, Lake, Indiana. She married Edward E. King on 3 October 1886 at Indiana. Carrie K. Merrill married John Charles Klemme, son of Heinrich August Christoph Klemme and Katharina Grages, on 7 April 1923 at Joliet, Will, Illinois, Mrs Carrie (Merrill) King and John Charles Klemme marriage announcement. Carrie K. Merrill died on 17 January 1957 at age 87 Carrie (Merrill) King Klemme obituary. Carrie K. Merrill had 4 with 4 living in 1900 children. Name Variation Katherine Elenore Klemme was also known as Catherine. Nickname Katherine Elenore Klemme also went by the name of Kate. Married Name 3 December 1917 As of 3 December 1917,her married name was Hartmann. Married Name 1957 As of 1957,her married name was Tatge. Katherine Elenore Klemme was born on 23 October 1894 at Crete, Will, Illinois. Katherine Elenore Klemme married Arnold Carl Hartmann, son of Johann Heinrich Hartmann and Katharina Hilgert, on 3 December 1917 at Crown Point, Indiana. Katherine Elenore Klemme witnessed the burial of Margaret Erickson in May 1948 at Illinois; Mr and Mrs Walter Klemme and daughter Joan, Mrs Leslie Adams, Mrs Dee M Sumpter, Mrs Gus Janetske and Mrs A C Hartmann attended funeral services for Margaret Erickson at the West End funeral chapel, Chicago Heights, last Wednesday afternoon. Miss Erickson, who died suddenly May 9 at her home in Chicago was a sister of Mrs Klemme and was a former resident of Chicago Heights. 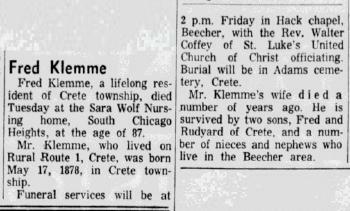 Katherine Elenore Klemme witnessed the burial of Heinrich Wilhelm Klemme in January 1953 at Saint Luke Cemetery, Beecher, Will, Illinois. 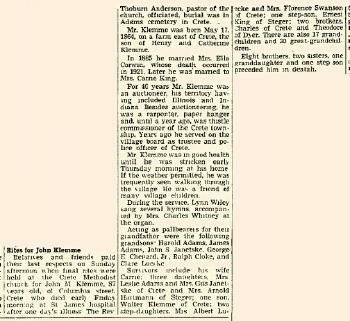 Katherine Elenore Klemme witnessed the burial of Henry E. Klemme in January 1953 at Zion Evangelical and Reformed Church, Hanover Prairie, Dyer, Indiana; Henry Klemme funeral notice. Katherine Elenore Klemme married Heinrich Albert Tatge, son of Wilhelm Christ Tatge and Matilde Engelking, in 1957. 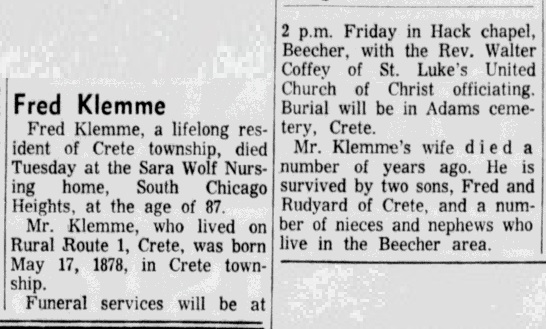 Katherine Elenore Klemme died on 23 November 1973 at Crete, Will, Illinois, at age 79. She was buried after 23 November 1973 at Adams Cemetery, Crete, Will, Illinois. Katherine Elenore Klemme obtained US Social Security Card at Illinois; last residence Crete, Will, Illinois. On 12 October 1961 at Crete, Will, Illinois, Leslie and Ida (Klemme) Adams 50th wedding anniversary celebration. On 28 April 1963 at Crete, Will, Illinois, attended Gus and Edna (Klemme) Janetske 40th wedding anniversary surprise party. [S193] Church Record, Zion United Lake Co IN Extract, Pg 674. No. 99. [S243] U.S. Federal Census 1920 U.S. Federal Census, by Ancestry.com, ED10. Sheet 14B. Dwelling 53. Name Variation Arnold Carl Hartmann was also known as A. C.
Name Variation Arnold Carl Hartmann was also known as Arnold Charles. Arnold Carl Hartmann was born on 9 December 1891 at Crete, Will, Illinois. He was the son of Johann Heinrich Hartmann and Katharina Hilgert. 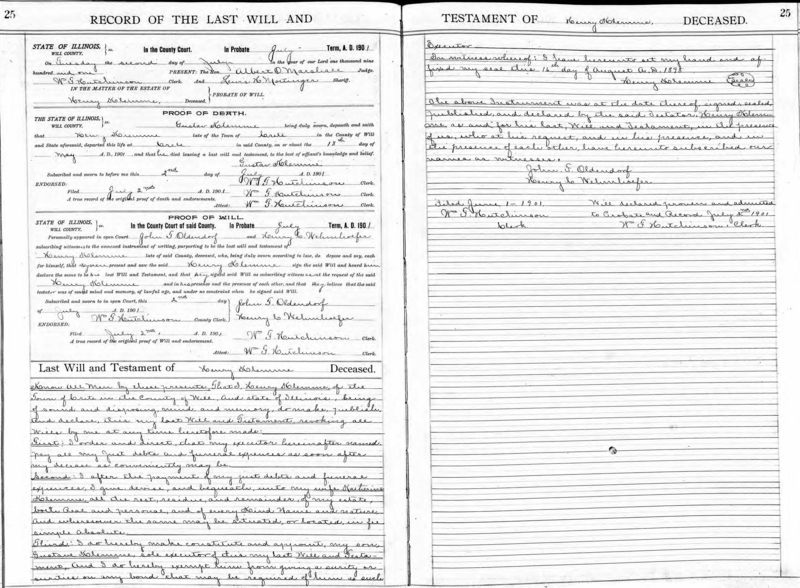 Arnold Carl Hartmann married Katherine Elenore Klemme, daughter of John Charles Klemme and Ella Sarah Corwin, on 3 December 1917 at Crown Point, Indiana. Arnold Carl Hartmann witnessed the burial of Henry E. Klemme in January 1953 at Zion Evangelical and Reformed Church, Hanover Prairie, Dyer, Indiana; Henry Klemme funeral notice. He was buried after 26 June 1954 at Crete, Will, Illinois. Name Variation Walter William Klemme was also known as Wilhelm Walter. He was born on 21 November 1897 at Crete, Will, Illinois. Walter William Klemme married Helen Evangeline Erickson, daughter of (?) Erickson, on 31 July 1922 at Crown Point, Lake, Indiana. 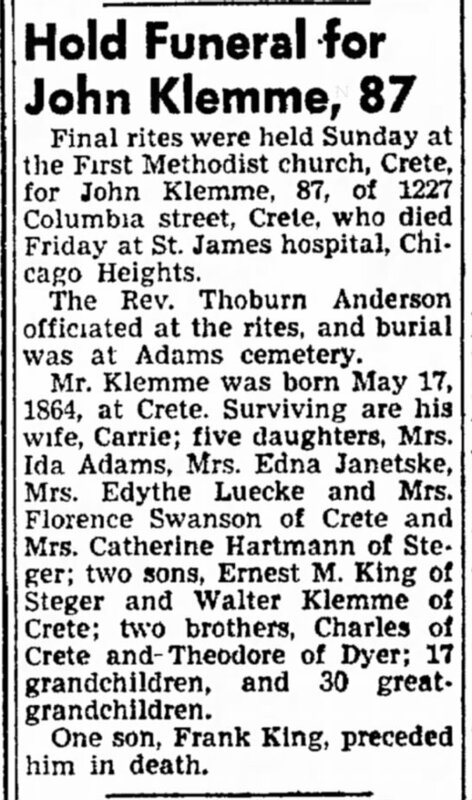 Walter William Klemme witnessed the burial of Margaret Erickson in May 1948 at Illinois; Mr and Mrs Walter Klemme and daughter Joan, Mrs Leslie Adams, Mrs Dee M Sumpter, Mrs Gus Janetske and Mrs A C Hartmann attended funeral services for Margaret Erickson at the West End funeral chapel, Chicago Heights, last Wednesday afternoon. Miss Erickson, who died suddenly May 9 at her home in Chicago was a sister of Mrs Klemme and was a former resident of Chicago Heights. Walter William Klemme witnessed the burial of Heinrich Wilhelm Klemme in January 1953 at Saint Luke Cemetery, Beecher, Will, Illinois. Walter William Klemme witnessed the burial of Henry E. Klemme in January 1953 at Zion Evangelical and Reformed Church, Hanover Prairie, Dyer, Indiana; Henry Klemme funeral notice. Walter William Klemme died on 20 November 1963 at Arizona at age 65 Walter Klemme obituary. He was buried after 20 November 1963 at Skyline Cemetery (aka Skyline Memorial Park), Monee, Will, Illinois. Walter William Klemme obtained US Social Security Card at Illinois; Last residence is listed as Illinois. On 12 October 1961 at Crete, Will, Illinois, Leslie and Ida (Klemme) Adams 50th wedding anniversary celebration. [S193] Church Record, Zion United Lake Co IN Extract, Pg 712. No 104. [S250] U.S. Federal Census 1930 U.S. Federal Census, by Ancestry.com, ED99-2. Dwelling 98. Sheet 4A. Married Name 31 July 1922 As of 31 July 1922,her married name was Klemme. 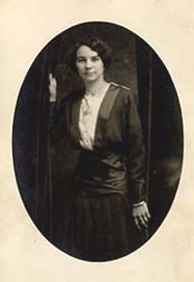 Helen Evangeline Erickson was born circa 1901 at Alabama. She was the daughter of (?) Erickson. Helen Evangeline Erickson married Walter William Klemme, son of John Charles Klemme and Ella Sarah Corwin, on 31 July 1922 at Crown Point, Lake, Indiana. Helen Evangeline Erickson witnessed the burial of Margaret Erickson in May 1948 at Illinois; Mr and Mrs Walter Klemme and daughter Joan, Mrs Leslie Adams, Mrs Dee M Sumpter, Mrs Gus Janetske and Mrs A C Hartmann attended funeral services for Margaret Erickson at the West End funeral chapel, Chicago Heights, last Wednesday afternoon. Miss Erickson, who died suddenly May 9 at her home in Chicago was a sister of Mrs Klemme and was a former resident of Chicago Heights. Helen Evangeline Erickson witnessed the burial of Heinrich Wilhelm Klemme in January 1953 at Saint Luke Cemetery, Beecher, Will, Illinois. Helen Evangeline Erickson witnessed the burial of Henry E. Klemme in January 1953 at Zion Evangelical and Reformed Church, Hanover Prairie, Dyer, Indiana; Henry Klemme funeral notice. Helen Evangeline Erickson died on 26 February 1960. She was buried after 26 February 1960 at Skyline Cemetery (aka Skyline Memorial Park), Monee, Will, Illinois.